If your kid’s toys are anything like mine, they completely take over my yard, garage, and house! 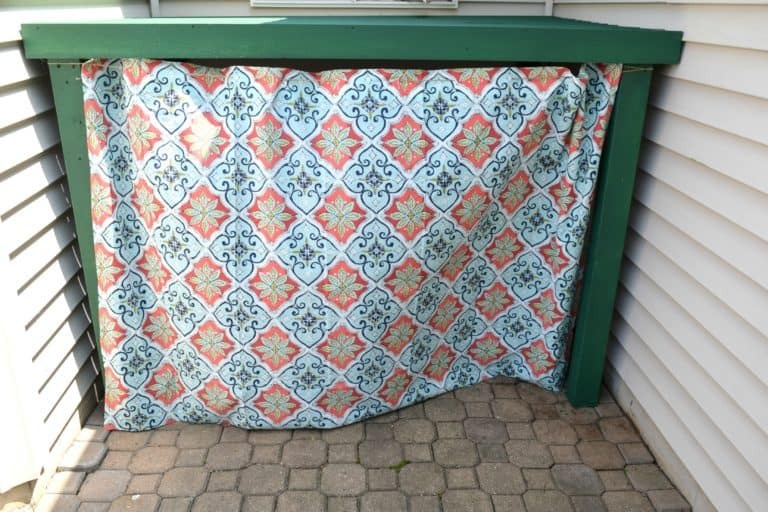 I decided it was time to get organized once and for all, so I went on a hunt to find the best outdoor toy storage solutions. There are so many wonderful and easy ideas out there, and I wanted them compiled in a straightforward list. If you are tired of having toys everywhere you turn, you should consider getting organized too! Check out these helpful ideas for your next project. 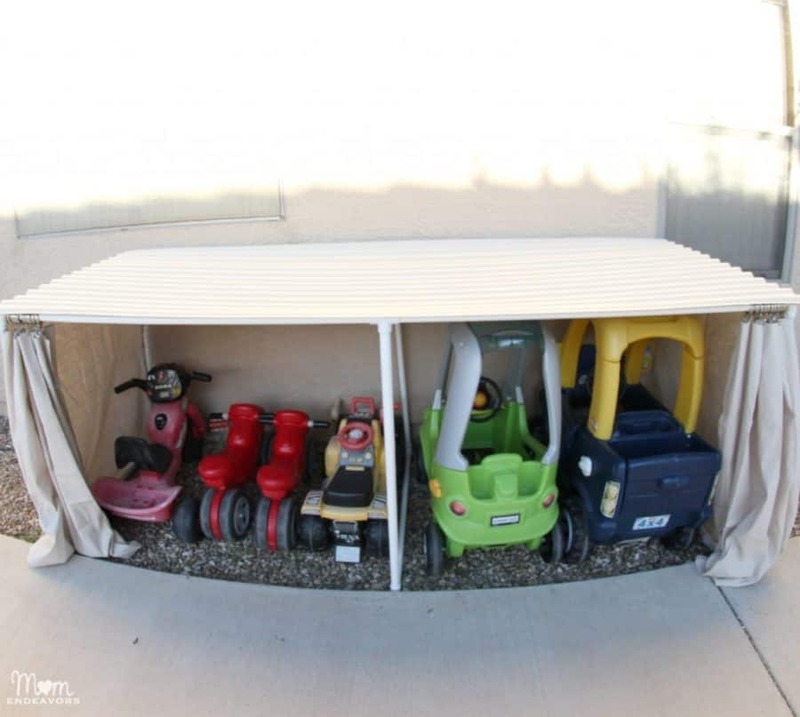 Sara at Mom Endeavours didn’t have a place for all your children outside toys, so she developed a fantastic parking garage to store those outdoor toys. It turned out fantastic and was surprisingly easy to make. Try it yourself! Domestic Charm got decided it was time to buckle down about organizing her kid’s toys. She used some vinyl labels and some buckets and went crazy! It looks so fresh, clean and organized now. See how she did it. 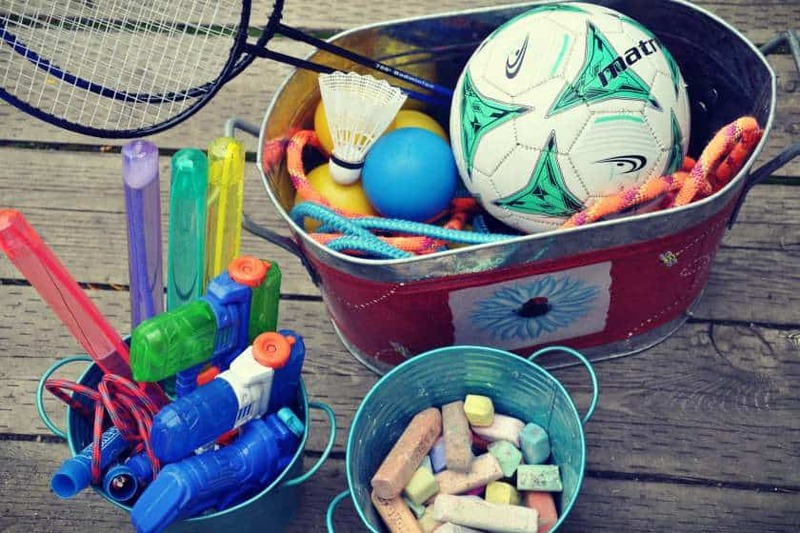 Mandi at Life Your Way shares several ideas on how to get more organized with your outdoor toys. It is incredible how much better it feels once everything is finally organized. Get some inspiration here. 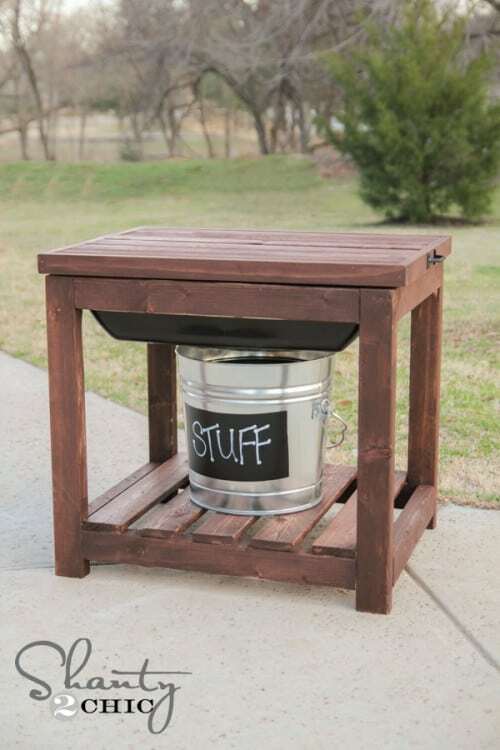 Shanty 2 Chic provides printable plans and a tutorial video so you can create and make your rolling storage cart. 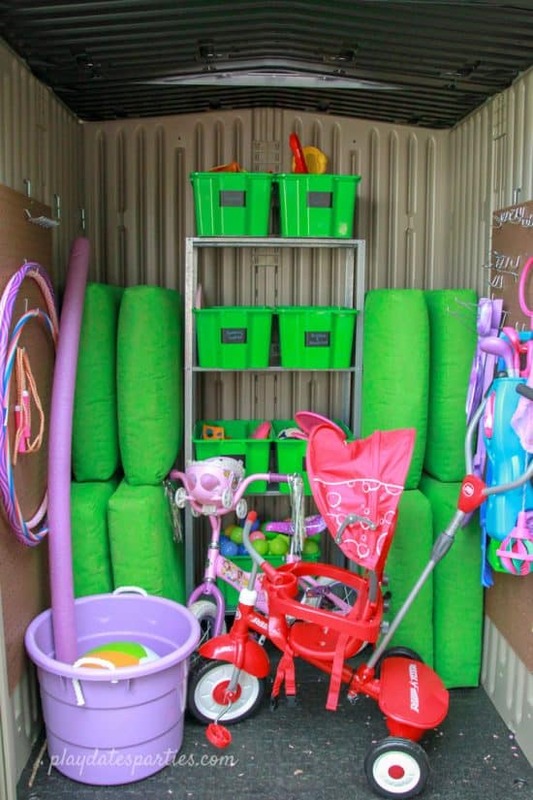 This storage unit is so awesome, and you can fit a ton of stuff in it. Everyone needs one of these. Take a look. 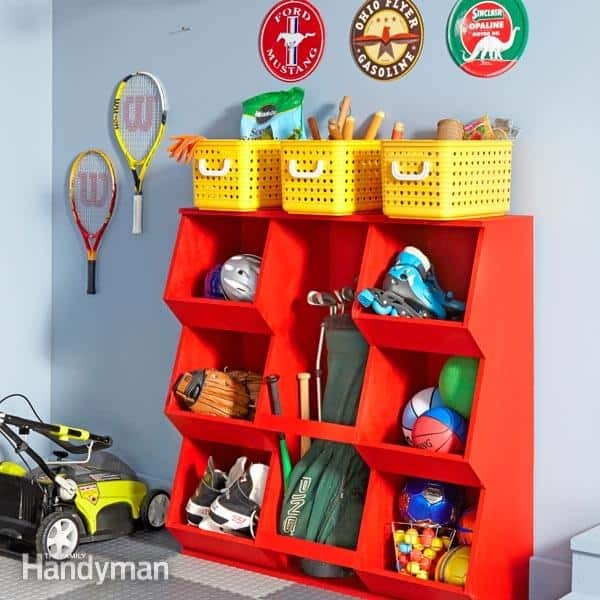 100 Things 2 Do share how they made a marvelous storage unit for holding all of their soccer (or soccer rebounders), volleyball, and basketballs. The rack takes no time at all to put together, and you need minimal materials. 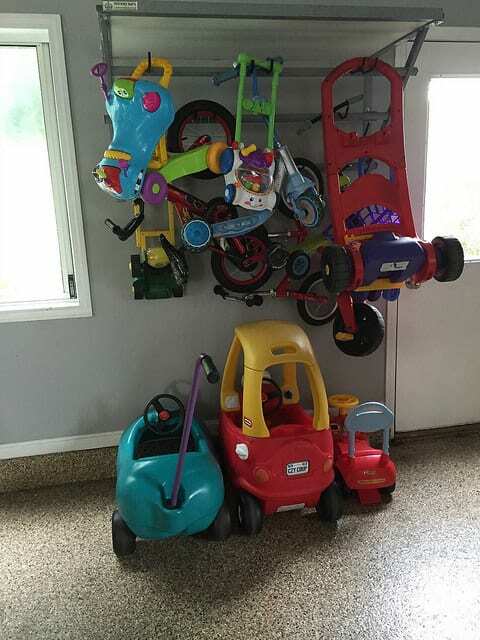 The Creativity Exchange explain how they added a nice pegboard to give the garage an organized look for storing outdoor toys. Everything is orderly and in its place. Check it out. 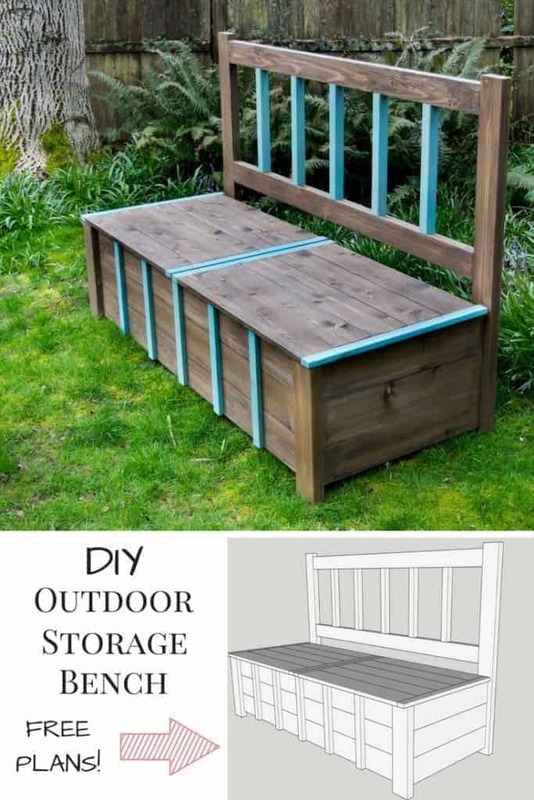 The Handyman’s Daughter share instructions on how to make a nice sized storage bench for all your outdoor toys and other items. It looks fantastic, and you can fit a lot of things there. See how they made it. Our House Now A Home got tired of having a messy outside that was full of toys and other kid stuff. So, they decided it was time to get organized and came up with the perfect solution. See how they did it. Family Handyman shares a fantastic tutorial on how to make your DIY toy storage system that will work for you! It looks pleasant and organized. See what they did. I’m An Organizing Junkie wanted to a simple solution for her children’s toys so that the child could independently put all the toys right where they belong after usage. It turned out wonderfully! Check it out. 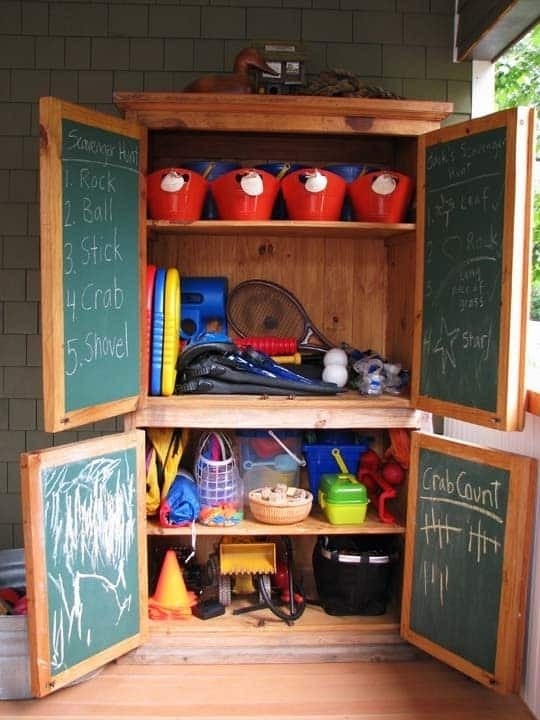 Leslie at Plays To Parties provides five tips on how she got their outdoor toys organized and stored correctly. She has some great tips and ideas. See her thoughts here. Take Them Outside was tired of seeing discarded and unused toys in her yard. So she came up with a solution for storing toys as well as rotating them out. See her bright idea here. 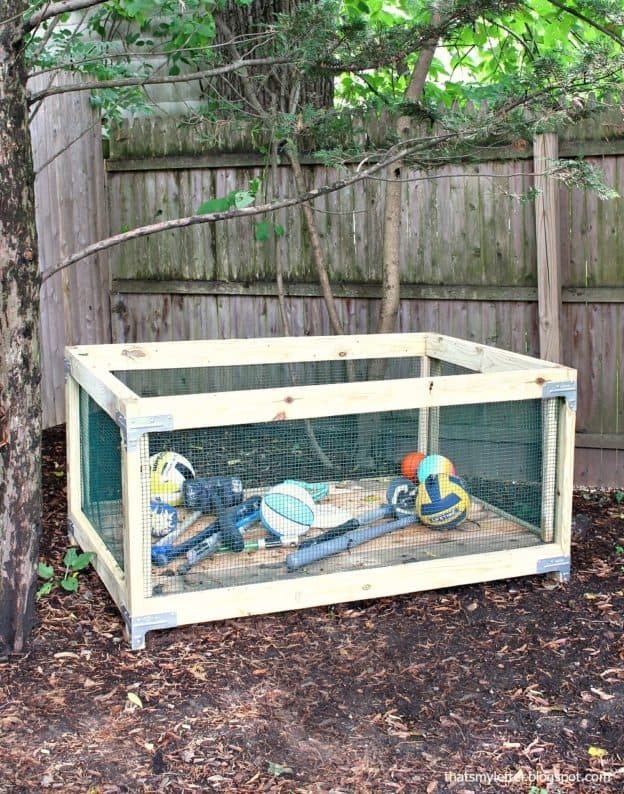 DIY Done Right gives you a detailed look at how they made a large toy storage bin that can hold all kinds of toys. It turned out amazing! Check it out. We’re Parents turned their DIY toy shed into a family project. It even has a roof on it and can hold a lot of outdoor toys. They also figured out that they can have many uses from this shed in the future too. See what they made. 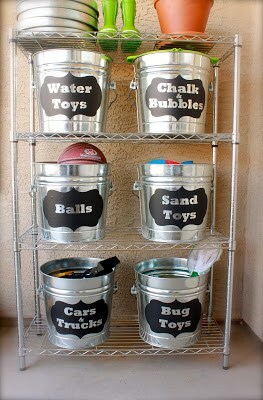 Our Wonderfilled Life shows us how to get your kids sandbox toys in order with their organizing solution. The bright colors keep it fun and playful while being functional. Take a peek. 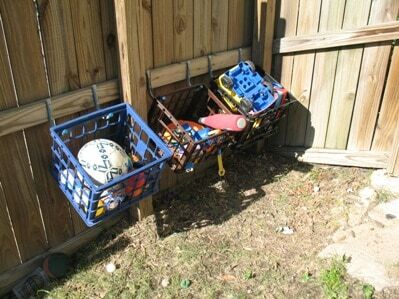 Apartment Therapy shows us how to make your backyard toy pantry. They even added chalkboards to it for even more entertainment. Such a creative idea. Check it out. I Heart Organizing did a fantastic job organizing their outdoor toys. They didn’t use a lot of materials and made a considerable improvement. It looks fresh and clean. Take a look. If you are looking to organize all of your kid’s bikes and other rideable toys you have to take a look at the tutorial by Refresh Living. 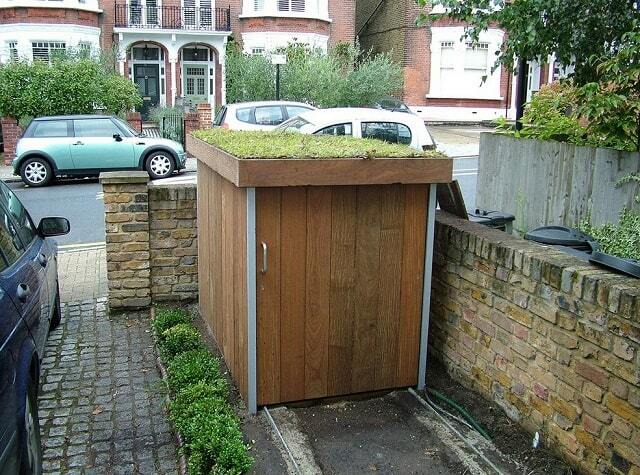 Believe it or not, installing a roof on it was simple! You have to see this. 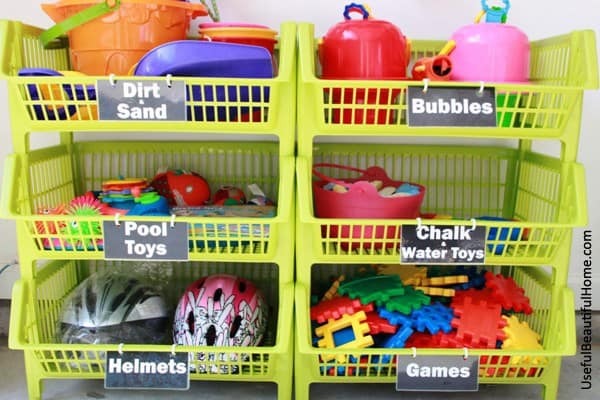 The Organized Mama shows you how you can transform milk crates and zip ties into an excellent solution for toy organization. It is great because you can see exactly where everything belongs. See how she did it. 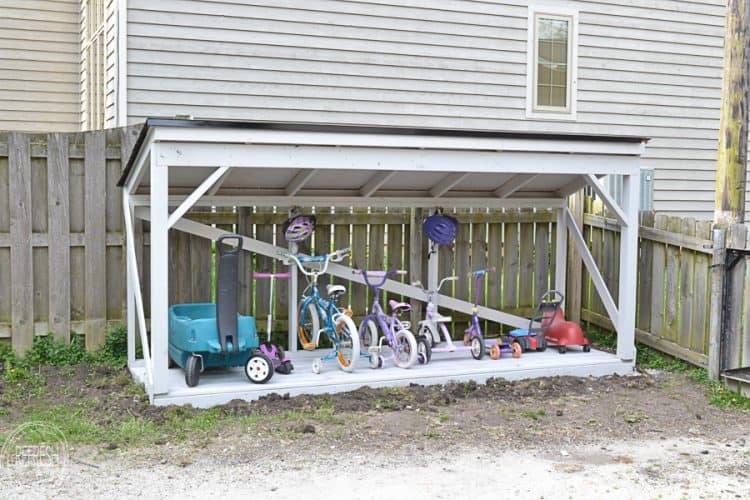 ICreativeD has found a way to make a truly unique bicycle storage shack. The door is on sliders, and it opens so you can access all your items quickly. It is a perfect size if you don’t have a big yard. See it here. Andrea Dekker shares how she got all of their outdoor toys and tools organized once and for all. Everything is straightened out and orderly now. How she did it. Shanty 2 Chic offers a tutorial explaining how to make a sandbox with shelf for organizing those sandbox toys. The kids will love it, and you will like how everything is one place. Make your own. 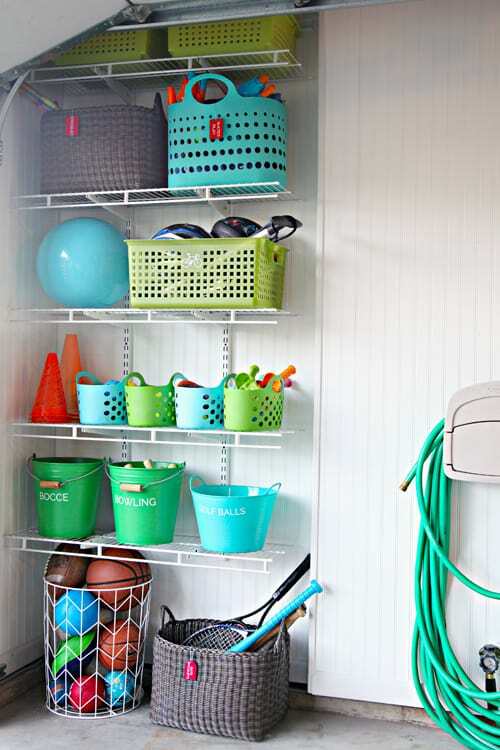 I Heart Organizing found a great way to organize skates, trucks, pool toys and more. She used tubs and labeled them and conveniently organized them on a shelf in the garage. It looks wonderful! See for yourself. Happy Hooligans shares several tips and ideas for sandbox toy ideas as well as organizing. It is a fun and helpful post that can inspire you to find a storage solution. Check it out. 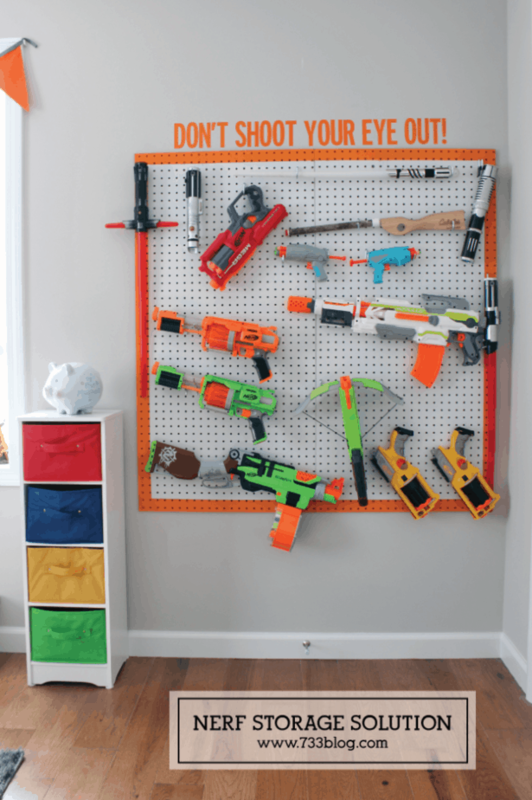 If your kids have a ton of nerf guns that need to be organized, take a look at the article by Inspiration Made Simple. She made a pegboard organizer that works great! See how here. I hope you found some great ideas for your next organizing project. Which one do you think your kids would like the best? Let us know in the comments!